Members of a Baptist church in Red Bank, South Carolina, have caused a stir for recently voting to remove a statue of Jesus from the front of their building because it appears too "Catholic in nature." A WAFB report said members of the Red Bank Baptist Church voted 131 to 40 to remove the statue that was created by a former member and graced the front of their church for more than a decade, because it was causing confusion about their theology among members of the church community. Jeff Wright, Red Bank's senior pastor, and Mike Dennis, the church's chairman of deacons, said in a letter dated May 10 that former member and artist Bert Baker, who hand carved the statue for the church in 2007, now has until May 31 to remove the statue. "God has gifted you with a tremendous artistic ability and we are thankful that you shared it with our congregation and are using this talent to bring God glory," the church officials wrote Baker in the letter. "Recently, it has been brought to our attention that the art is causing confusion in the community. We have discovered that there are people that view the art as Catholic in nature. We understand that this is not a Catholic icon, however, people perceive it in these terms," the letter continued. "... It is bringing into question the theology and core values of Red Bank Baptist Church." Responding to the church's concerns, Baker said he found it odd that the sculpture is just now causing confusion after being at the church for 11 years. 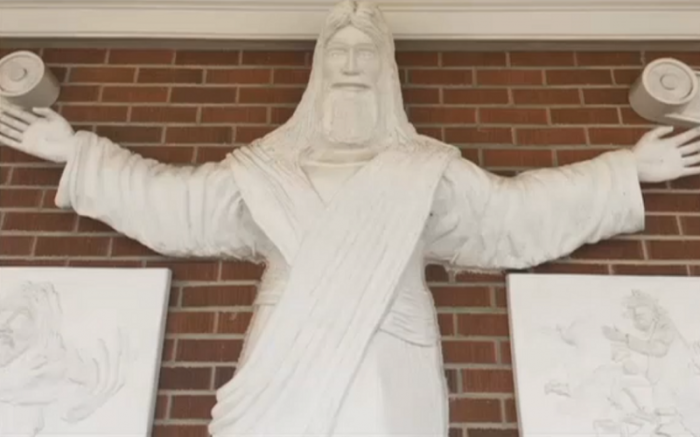 "These sculptures have been gracing the front of RBBC for 11 years and at no time then or now has anyone ever been 'confused' as to who Red Bank Baptist is nor has anyone ever suggested that they are 'Catholic' in nature," Baker wrote. "I am stunned that your letter both insults the intelligence of the Red Bank Community (as not intelligent enough to know that Red Bank Baptist Church is a Baptist church despite having a large sign stating as much); and, more disturbing, singling out the Catholic church in such a manner as to suggest that their denomination is deficient in theology and lacking in Christian core values," he added. Explaining that he did not want to see his work destroyed, Baker urged the church officials to give the statue to another church or sell it and use the proceeds for missions. He further told The State on Tuesday that the reason the church has given to remove his statue is "crazy." "I'm not interested in stirring the pot, but people not liking it because it looked too Catholic is crazy, man. It's been up there for 11 years. I don't agree with the letter, it bothers me," he said. Both the letter from the church officials as well and the response from Baker are now being circulated online by concerned Christians, like Rhonda Davis, who argue that discrimination should not exist between Christian denominations. "It is both disturbing and sad that in a time when we are all needing to come together as brothers and sisters in Christ to project and reflect His love to a lost and dying world, Red Bank has decided to single out another denomination as the reason behind the decision to avoid any real or imagined fear that they would somehow be associated with them AND to further insult the intelligence of an entire community who for 11 years never once has been confused about who Red Bank Baptist Church is with or without the sculptures," Davis noted.